I am a lucky boy. Sometimes I get a ukulele on loan that genuinely makes me gasp when I first open the box. And this Pono musical instrument hit that right on the button with this new model in the shape of the ATDC Tenor. I mean, just look at it. First, the specs and background to that name. 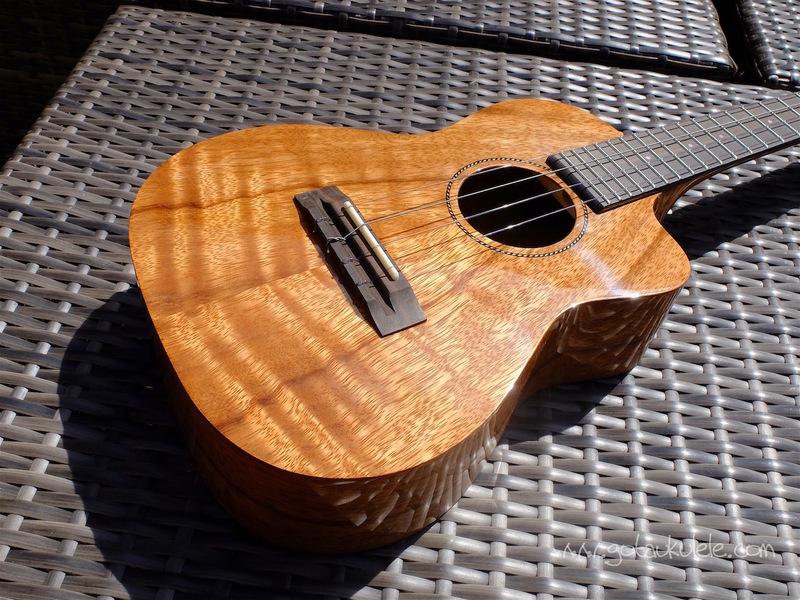 The ATDC is a solid Acacia (the A) Tenor scale (the T) gloss finished (which Pono call their 'deluxe', there's the D) ukulele with a cutaway for upper fret access (the C). The model is also available and has been for some time in ATD form without the cutaway, but this is a new addition. And I think it just looks pure class. For those that don't know, Pono are the Asian line of master Hawaiian Ukulele makers Ko'olau. So essentially a line of instruments made outside Hawaii to save cost, but made under the careful watch of one of the oldest and most revered ukulele makers on the planet. And what I have found with other examples from Pono (hey, not wishing to show bias here, but I own three!) is that they create a balance between the highest end instruments but at a more consumer friendly price point. I'll go further and say that I consider Pono to be pretty much my favourite brand for that reason. But that is based on the others I own... will my view change when I get into this one? 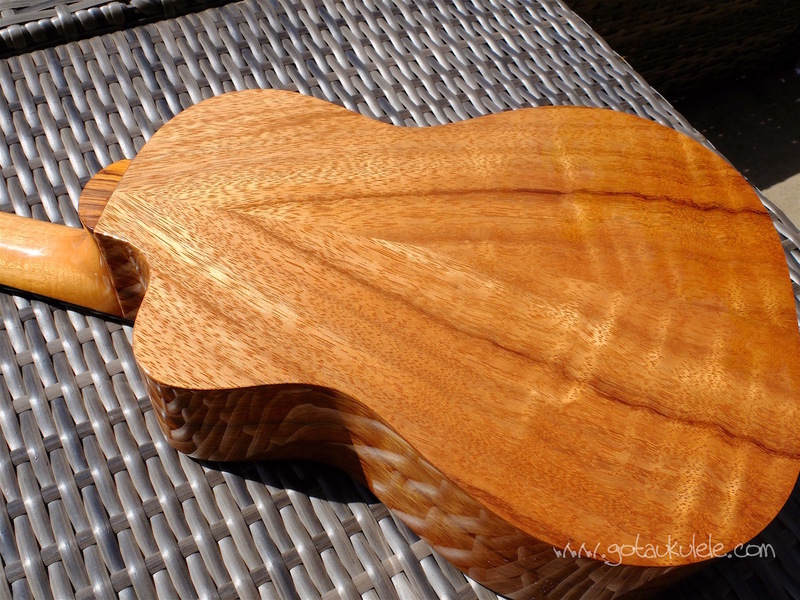 The ATDC is a fairly standard sized and shaped tenor ukulele (double bout, flat base) only modified by that cutaway. 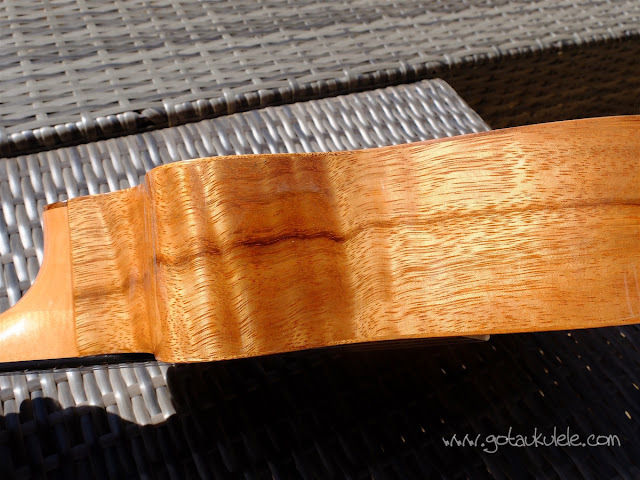 It's made from all solid acacia wood, a tone wood used due to it's striking looks and similarity to Hawaiian koa. 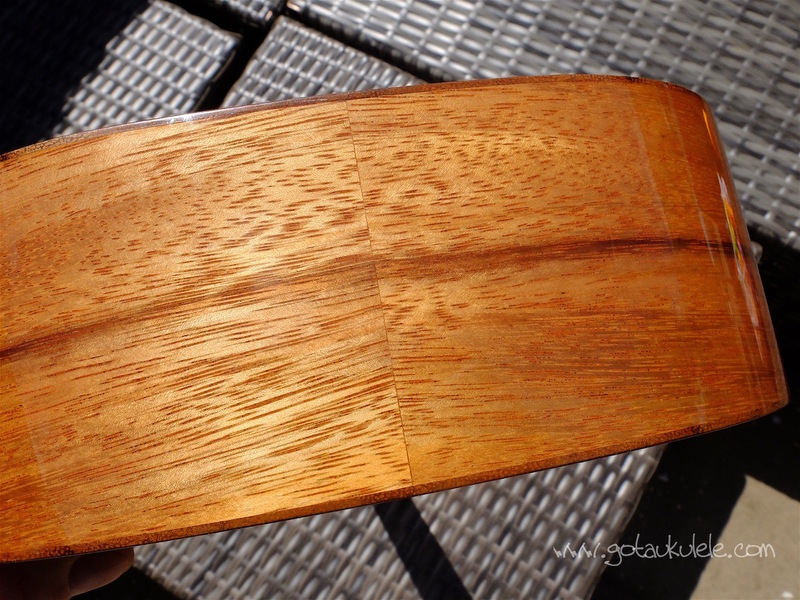 It's a type of koa, but not from Hawaii and that means a far more reasonable price. (If this was made from Hawaiian koa it would be signifiantly more expensive). Some more unscrupulous manufacturers call their acacia instruments 'koa' and argue that the they are technically correct. 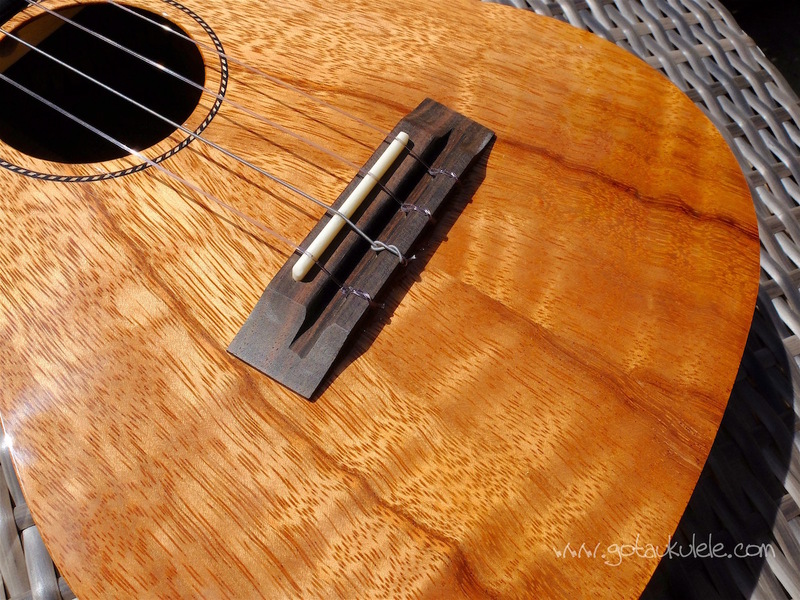 It's a bugbear of mine - when an instrument is called 'koa' it should relate to Hawaiian koa. Fair play to Pono for telling it like it is. If a brand sells acacia and simply calls it koa they are trying to mislead you. And that striking look of acacia certainly comes through on this one. We've got stripe, curl and flaming all in the one instrument and for a consumer level instrument, I think that's pretty awesome. First the top, this is made of two pieces, beautifully bookmatched with angled stripe fanning out towards the base. In the right light, that stripe really flames and shimmers on the lower bouts. It's quite beautiful and thankfully not spoiled with tons of other 'bling', only an inlaid rope marquetry soundhole rosette. When wood looks this good it really doesn't need inlays and binding. The sides are two pieces, perfectly bookmatched at the base and showing off some really wavy stripes at the upper bouts. The body depth is actually nice and chunky and deeper then many tenors which should help with projection. The back is very slightly arched and is also made from two pieces, which almost identically match the top. This is a nicely crafted instrument! The whole of the body is finished in gloss with a mirror finish and not pooling or bubbles. The gloss really sets off the stripe and flame on the woods and gives it a really high end feel and look. The saddle is a tie bar style and made from ebony with a bone saddle. A look inside reveals an extremely tidy build with absolutely no glue blobs, shavings or mess. The bracing looks delicate as does the notched kerfing. As well as the manufacturers label the end of the neck block inside is stamped 'Ko'olau Pono' together with the serial number. You can also spy the end of the truss rod (but more on that later). Up to the neck, I believe this is made from Mahogany, and from four pieces with a three piece stack at the heel and a joint at the headstock. It too is finished in gloss and the end of the heel is capped with a sliver of stripy acacia. It's a fairly rounded C chaped profile which I like. Topping the neck is an ebony fingerboard which is in great condition and has a very faint orangey stripe running through it. The edges are bound in black and it is fitted with 20 nickel silver frets with 14 to the body. They are all dressed perfectly and are on the jumbo side which I also like. We have pearloid dot position markers at the 5th, 7th, 10th, 12th and 15th spaces and thankfully these are repeated on the side. The nut width is a little wider than most far eastern tenors, but not quite as some like the Kanile'a K1. A word about that truss rod. This is something you dont see a lot on ukuleles but I see a lot on Pono instruments. It's basically a threaded bolt that runs through the full length of the neck. By tightening or loosening it (using the bolt I referred to above accessed via the sound hole) you can change the relief of the neck. 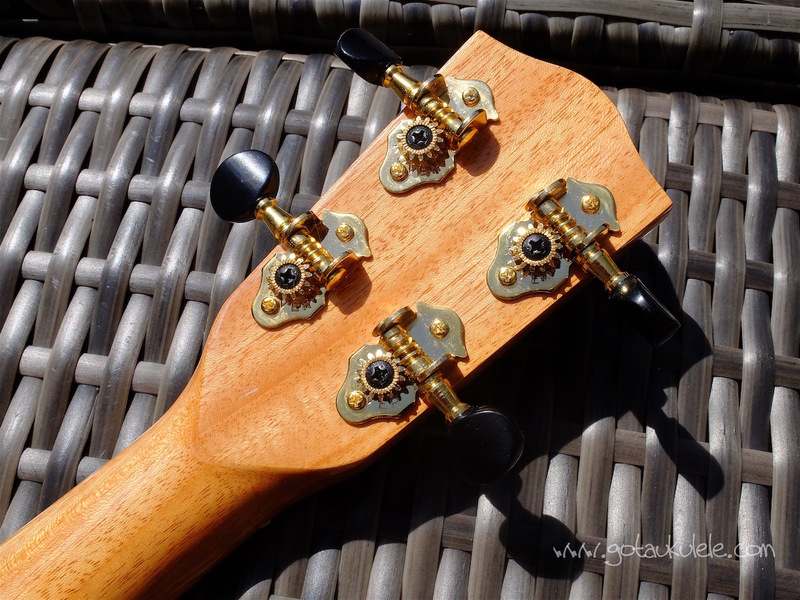 That isn't about action (people wrongly assume it is), but rather the very slight concave curve that a well setup neck should display to help avoid buzzing. The jury is out with me on the need for these on ukuleles as it's something that is more often adjusted on guitars in view of the considerably higher tension their strings exert on the neck. I just dont see that with ukuleles. Oh well, not a complaint and I suppose over the years it's a nice thing to have if age and humidity start to bend the neck. Past the nut which is made of bone, we have the usual Pono shaped headstock, faced in stripy acacia and inlaid with the Pono logo in white pearl. Tuning is catered for by my absolute favourite open geared Grover tuners in gold with small glossy black buttons. Regular readers will know I rate these tuners highly. When you bear in mind that they are used by Martin and Kanile'a on their tenors and that I specified them on my Tinguitar custom model you will know why! Finishing the deal are Ko'olau strings as is usual for Pono instruments. Some like them, and some don't. I'm in the don't category and to make matters worse this one has a wound C string (something else I despise!). Saying all of that, you should know by now that I don't rate ukuleles up or down based on the strings they come with. They are like car tyres - and you will most likely change them to your own preference. For that you will pay around $699 RRP or just under £500 in the UK. Yes, that's a serious price but when you consider that a K brand tenor will likely cost you twice that money, it's certainly mid level to me in terms of cost. You know my view on this - ukuleles are musical instruments and not toys. If you think a £100 ukulele is 'mid-level', then sorry, I completely disagree with you. So as you have probably gathered, it hasn't let me down so far.... will it let me down in playability? Firstly it's nicely weighted, balanced and set up. Nothing I would change at the bridge or the nut and that doesn't surprise me in the slightest with Pono. Intonation and action are just how I would want them. Sound wise I found it quite a surprise. It doesn't quite have the raw power of some of their mahogany bodied ukuleles I have played, but it improves on them with a really nice mix of chime and warmth. It's a complex sound that I really rather love actually. Strummed it can sound jangly in the way smaller bodied instruments do, whilst still having some bigger bodied warmth and resonance. Individual strings stand out in the mix clearly and the dynamic range is impressive. Sustain is excellent allowing you to easily add some tremolo to fingerpicked notes. In fact this thing really shines when fingerpicked. The clarity is superb and the range of frequencies it throws out really are far closer to some highest end instruments than the price would suggest. So different from mahogany, but then in should be because... err... it's not mahogany. I really like it actually. That chime and warmth together makes for a nice sound to my ears. In fact the more I play it the MORE I like it. Why am I beating around the bush? Just come out with it Barry... OK - it's the nicest Pono I've personally played. So all in all, Pono have done it again I'd say. It has looks to die for, a complex and interesting tone and is just brilliantly made. A ukulele that shimmers with both it's looks and it's sound. I've never played a Pono I didn't like and this one doesn't buck that trend. In fact I'm quite annoyed with you Pono. 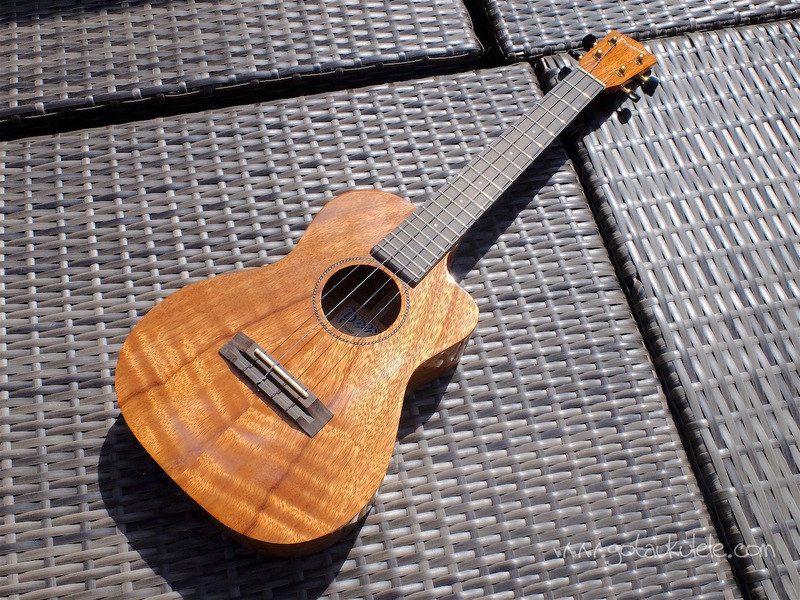 I have been downsizing my ukulele collection and I REALLY want to own this one...!!! I'd change the strings! But nothing else really! I want one, no, I NEED one! I think there is going to be a lot of interest in these. And rightly so. That she whole package. Drool worthy. Nice review. I have a Pono RT-PC Cedar and yours has a warmer sound. What are the two Hawaiian songs you play, first at 6:05 and the second at 6:50? I've heard them before and would like to learn them. Raduray - neither song is Hawaiian - the song at 6.05 is called Wish I Could Shimmy Like My Sister Kate and at 6.50 it's Creep by Radiohead transposed to C. Chords for both on my tab page accessed from top menu. I have a Pono ACD (I think), I love it. Best uke I have, sound great, looks great and is a significant improvement on everything else I have. I thought I hated the gold strings that come with the Pono and put Living Water ones on. Brough an Ohana Sopranino (can't get a JD) and realised how much I despised the Aquilas. Popped the gold strings on the Sopranino and it sounds a million times better. Must have been in a receptive mood because after watching this I bought one of these. Definitely worth it! It is absolutely beautiful and sounds wonderful! Tell the folks at Pono that they should let you keep this one since you made a sale by your review. :) Mine has a cedar top and I just love the sound - it just rings! Thanks for the promo. Hi Barry, thanks for your reviews! How does this compare with the ATD. Is the only difference the cutaway? Yes - that's the only difference I am aware of. Your use of the word "Shimmer", to describe the sound of this Pono and a few others, has caused sone debate among some that follow your reviews. THIS is several comments from a recent post on a page, that I think misses the mark on your meaning of the term "Shimner"...could you clarify this term for me and others. "Sounds nice! But what is a shimmer effect?" **(Individual posting SHIMMER Audio only Sound Sample"
"I define it as the string vibration going to each end and then coming back to the middle, going slightly out of tune and then in tune. As the vibrations meet and bounce off each other." "Are you doing some technique for that or is it just how your instrument sounds? Would this also be called sustain?" Its more than sustain may be hard to hear. "What are you doing to get the effect?" I don't interpret your use if the term Shimner in your Reviews this way. 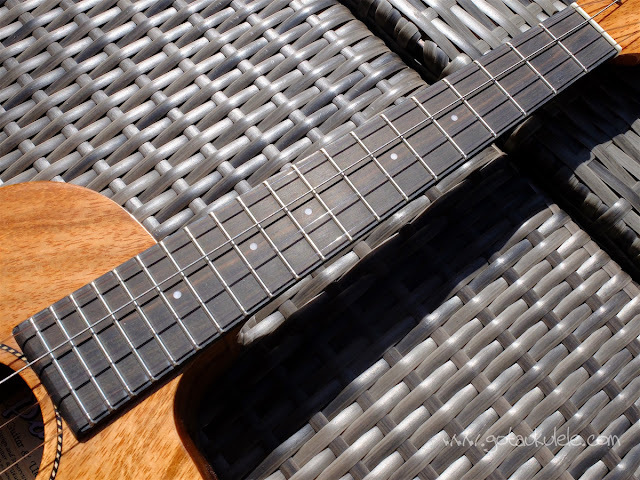 I feel, you are saying the ukulele resonates or reverberates acoustically in a unique manner, as an inherent acoustic characteristic of a particular ukulele and NOT something one could mechanically re-create using a special technique on almost any ukulele. Could you possibly clarify exactly what you mean when you say shimmer and whether anyone playing any ukulele can replicate it "on demand" so to speak? Phew - never thought about it in that detail Denny, so can only give you my perspective. Also no - dont think it's down to playing style either. For me, what I mean is the kind of chime that a well balanced instrument projects when all strings are played - so it's a combined resonance. Hard to explain beyond that, but I think it's a mix of a well set up instrument combined with a well made one that allows all strings to ring equally. When you have that shimmer it comes from all strings being clear in the mix and that develops harmonic overtones between them. I found your site and am very thankful. Please give your thoughts between the Pono AT $330 and the ATD $480. Besides the finish it looks like the AT does not have a truss rod.Which do you think is a better value for the money? Ken - I had no idea the AT had no truss rod- personally I thought that all tenor Ponos had them. No matter - never really saw the need for one myself and certainly wouldn't not buy an instrument without one. Very few have them anyway. I always thought the only difference was the lack of gloss. Some say that changes the sound, but personally I think it's too subtle and subjective to worry about. I own mainly un glossed Pono instruments if that helps! Some people love the look of the gloss though. Very subjective. 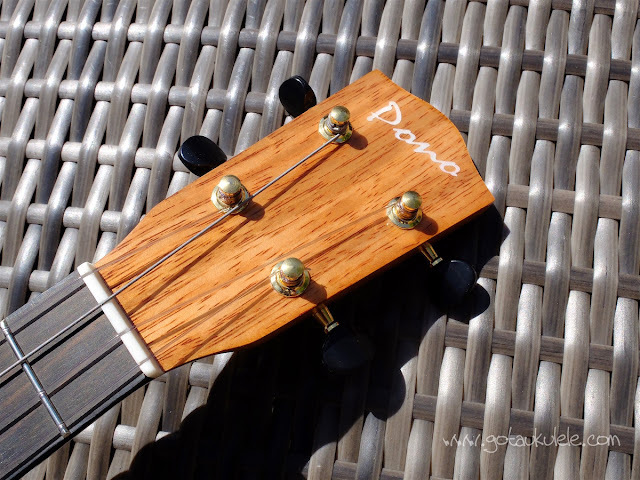 After reading your reply and more research the Pono AT does indeed have a truss rod. Sorry for the confusion my local store"Funky Frets" had an AS and AC in stock which do not so I thought only the Deluxe's had one.I ordered the AT today. The kremona is very good but I’d take the Pono! I just bought this uke. Love it! But, the Pono logo on the headstock on mine is black. I am looking at this Pono and the Martin T1K. Do you have a suggestion?